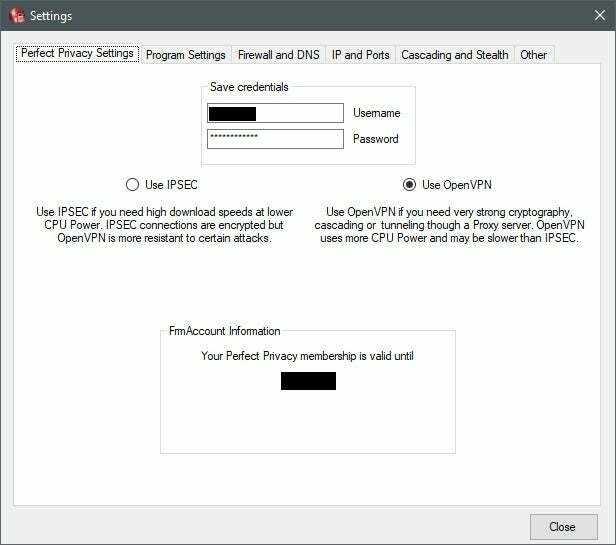 Perfect Privacy is a little known VPN with a shadowy ownership structure but good performance and an antiquated interface. Some VPNs are built for users who want information, and that’s what Perfect Privacy aims to deliver. We’ve seen VPN services that offer even more information, but Perfect Privacy offers some key bits of data right up front for every server location. After you sign in to Perfect Privacy you’re confronted with a long list of server locations—37 total in 23 countries. 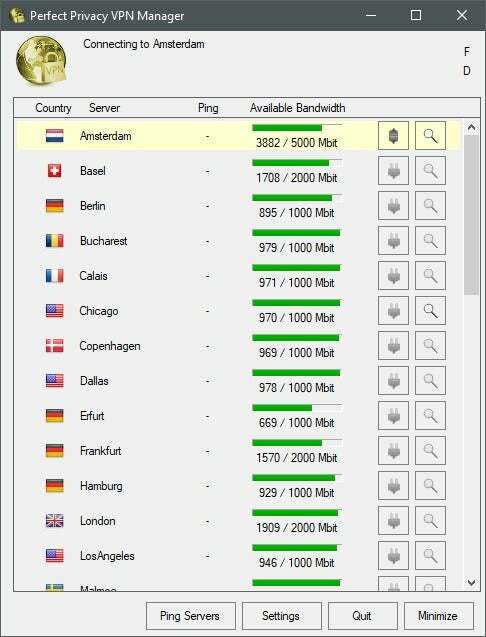 Each server location lists the country, city, and available bandwidth on each server by default. There’s also a ping column that you can activate by clicking the Ping Servers button at the bottom of the window. The available bandwidth indicator is particularly helpful. Many other VPN services offer this feature, but it’s usually displayed as a percentage. Perfect Privacy, by comparison, shows you how many megabits are free on each server. At this writing, for example, 967Mb were free on the Miami server out of 1,000Mb and 1,650 out of 2,000Mb were free on a server in Luxembourg. To connect, you click the plug icon for your server of choice on the far right of the window. While Perfect Privacy is fairly straightforward, the interface is very dated and utilitarian. The long list, the gray background, the small text, and the large buttons at the bottom of the window all add up to a very old look. That may be fine for those who just want to click a button and get rid of the VPN window, but this app could be a lot easier to use. Perfect Privacy’s settings area offers a bunch of features you can tweak. When you first sign in you have the option to use the OpenVPN protocol or IPSEC. By default, Perfect Privacy chooses OpenVPN, and helpfully it includes a short explanation about who should use which protocol. Perfect Privacy has some of the key options most VPNs offer including the ability to start Windows and autoconnect on startup. Helpfully, these two options are not selected by default, which is a big plus in our book. Advanced users will want to look under Settings > Cascading and Stealth. Here you can enable the ability to create a connection via multiple VPN servers. You can start with an American server, for example, and then hop to a British one. Perfect Privacy allows up to four hops—i.e. four different servers before you hit the open internet. Perfect Privacy’s primary settings tab. Perfect Privacy is super expensive at €120 (approximately $138US) for a year compared to other services, many of which are available at half that. The one thing Perfect Privacy does offer for that higher price, however, is no hard limit on the amount of devices you can connect to the VPN at once as long as they are devices owned by you. In our tests, Perfect Privacy did very well. Overall, it retained around 36 percent of the base speed. That’s not an outstanding score, but a lot of the key locations were very fast including the U.S., UK, Germany, and Australia. The Asian servers we tested were a little weaker and varied quite a bit. Still, Perfect Privacy should be fast enough for most uses. To sign up for Perfect Privacy it requires you to choose a username and an email address. That makes it pretty easy to keep your identity anonymous since it doesn’t ask for a real name. Perfect Privacy accepts credit cards (via Paymentwall), PayPal, Bitcoin via Bitpay, and regular old cash. Perfect Privacy doesn’t provide detailed instructions about how to pay with cash, but the best thing to do would probably be to include the money and a letter with your username and account email. When the payment is processed Perfect Privacy will send you a confirmation message. Paying via cash isn’t the safest way to make a payment to an overseas company, but the risk can be worth it for those who want maximum privacy—just watch out for the postmark as that can give away your general location. The company doesn’t provide who’s behind it, and the actual location is also a little confusing. The company is officially registered in Switzerland as Vectura Datamanagement LTD. The technical offices, meanwhile, are in Panama. If you want to pay in cash, however, you have to send your money to 14-2 Terbatas Street Riga, LV-1011 Latvia. As the fictional version of Woodward and Bernstein told us in All the President’s Men, “Follow the money.” I’d bet that where the cash gets sent is where Perfect Privacy’s seat of power truly lies. As for its privacy promises. Perfect Privacy says it doesn’t log any of your browsing data or your account’s login activity. It does, however, record the “total usage ratio of the servers.” That’s how you can see how much bandwidth is available on each server. Perfect Privacy doesn't have the most advanced interface, but it does offer some helpful information. There's no hard limit on the amount of devices you can use simultaneously, but you will pay double or more what you would with other service. We also have some concerns that the leaders of this company prefer to remain anonymous.